The Julian Alps are a range of limestone mountains in Slovenia, near the borders with Italy and Austria. The highest point of the range is Triglav at 2,864m. This trekking holiday approaches the Julian Alps as a mountain range to be explored in depth. Your group immerses itself in the forests, high rocky valleys, ridges and peaks, arriving each night at a new hut. A particular benefit of trekking the Julian Alps with us is that the group's itinerary is very flexible. Our aim is to run this trek in the style of a group of friends, with the freedom to decide which paths to take according to people's wishes. A large network of huts is spread across the mountains, making the Julian Alps an excellent destination for a multi-day hut tour. The group sets off on the 5-day trek. Arriving back in the valley we enjoy a celebratory meal in one of the restaurants near Lake Bohinj. Mountain huts provide the group's accommodation for the 4 nights of the trek. For the first and last night of the holiday we stay in a friendly family-run 4-star hotel in Bohinj. Why Alpine Exploratory for your guided trip? The same careful research that goes into our self-guided Julian Alps trips informs our guided trips too. We keep on top of changes to the local routes and we place a lot of emphasis on good relations with our hotels and huts. Friendly welcomes await. As per our general ethos, even on our scheduled guided Julian Alps trips we like to be flexible. Single rooms are no problem in your valley hotel. If you'd like extra nights in Bohinj before or after the trek, please just ask us. Alpine Exploratory follows best practice in the mountains. 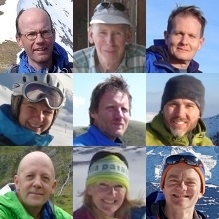 Our leaders are all International Mountain Leaders and we keep to a maximum group size of 8 clients. The aim is a small, tightly knit group with an engaging leader, completing the local walks with safety, proficiency and fun. On our Julian Alps hut treks, we move between mountain huts which are not reached by road. Thus baggage transfer is not possible - however, nor is it needed, because there is not too much to carry. We seek a simple trekking lifestyle. Also, you are welcome to leave luggage in the valley hotel while we trek. If you join us as a private group instead of joining our scheduled trips, then we can adjust your trip in various ways.